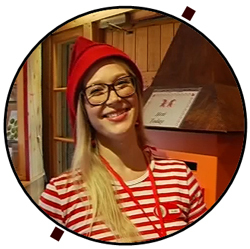 Home › Destinations › Rovaniemi › Do You Collect Stamps? Visit Santa Claus Post Office! On our Diamonds of the Arctic trip in 2014 we stumbled into the post office of Santa Claus in Rovaniemi. Elina, one of the elfs, greeted us with a big warm smile. She was sorting the mail Santa had received that day. Santa Claus receives a lot of mail from kids around the world. Remember, everybody under the age of 100 are kids, according to Santa. Then they become teenagers. In 2013 Santa received more than 500 000 letters. Kids from Italy are on top of the list of diligent nationalities sending letters and postcards to Santa. In the summer of 2014 Santa had received 16.5 million letters from 198 different countries in total. Even when kids don’t write the address correctly, the letters end up at Santa. The Elfs are sorting the letters country by country. Elina says they read all the greetings. The empty envelopes with the stamps are slid into packages of 30 and sold at Euro 3. The proceedings go to UNICEF, a charity UN organization helping kids in need. The “First Lady of the World”, Mrs. Eleanor Roosevelt, was one of the founders of UNICEF. She paid the Arctic Circle an historic visit in 1950. UNICEF was established after WWII, and also aided the war torn children of the Arctic. The UNICEF has a warm spot in the hearts of local kids in Rovaniemi. Beautiful stamps are collected every day by Santa. Few places are collecting so many letters from so many different countries. If you don’t collect stamps yourself, you might have a stamp loving friend. Tell them about the stamps in Rovaniemi. If you are an avid stamp lover and support UNICEF, pay Rovaniemi and Santa’s Main Post Office a visit. The children’s love for Santa is benefiting children in war torn countries such as Syria.